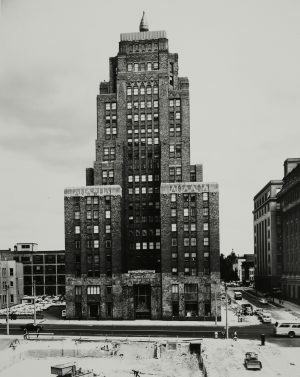 The iconic Gas Company Flame was added on top of the ESCHWEILER-designed WISCONSIN GAS BUILDING in 1956. Standing 21 feet and weighing 4 tons, the beacon provides navigational light for Lake Michigan vessels and indicates the local weather forecast by its color. The flame contained neon and argon tubing, but by spring 2014 was replaced with LED lights that saved operational costs and allowed a greater variety of displays. The flame was turned off from 1973 through 1985 because of the energy crisis but has otherwise been one of the most prominent landmarks of the Milwaukee skyline. When the flame is red, warm weather is ahead. When the flame is gold, watch out for cold. When the flame is blue, there’s no change in view. When there’s a flickering flame, expect snow or rain. ^ Molly Snyder, “Up Close and Personal with the Wisconsin Gas Light Building ‘Flame,’” OnMilwaukee, last modified September 5, 2011, accessed October 7, 2013. 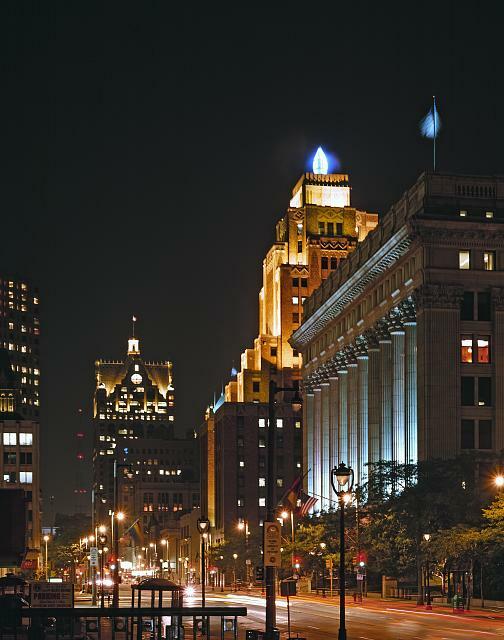 ^ Joseph J. Korom, Milwaukee Architecture: A Guide to Notable Buildings (Madison, WI: Prairie Oak Press, 1995), 15. ^ Doors Open Milwaukee, “Gas Light Building,” Historic Milwaukee, Inc., accessed October 7, 2013. ^ Korom, Milwaukee Architecture, 15. ^ Bobby Tanzilo, “Urban Spelunking: (Re)visiting the Wisconsin Gas Flame,” OnMilwaukee, last modified August 6, 2013, Accessed October 7, 2013. Doors Open Milwaukee. “Gas Light Building.” Historic Milwaukee, Inc. Accessed October 7, 2013. Korom, Joseph J. Milwaukee Architecture: A Guide to Notable Buildings. Madison, WI: Prairie Oak Press, 1995. Snyder, Molly. “Up Close and Personal with the Wisconsin Gas Light Building ‘Flame.’” OnMilwaukee. Last modified September 5, 2011. Accessed October 7, 2013. Tanzilo, Bobby. “Urban Spelunking: (Re)visiting the Wisconsin Gas Flame.” OnMilwaukee. Last modified August 6, 2013. Accessed October 7, 2013.